McQuaid’s Kobe Long (30) works against Niagara’s defense during second-half action, Saturday. Niagara Falls’s Willie Lightfoot defends on the play. ROCHESTER, N.Y. — It took a subtle adjustment on defense as well as progress made on offense. And a big third quarter. 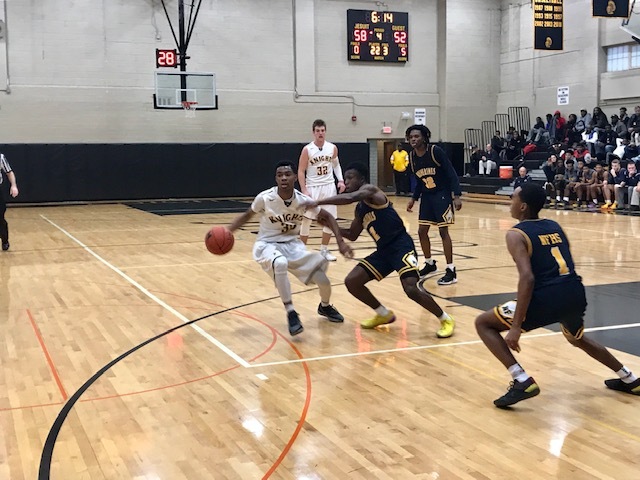 Jermaine Taggart scored 16 of his game-high 28 points coming out of the locker room as the McQuaid Jesuit Knights (No. 8 NYSSWA Class AA) erased a halftime deficit and went on to beat Niagara Falls (No. 9 NYSSWA Class AA) in overtime, 76-69. Trailing by eight after the first half, McQuaid went inside to Connor Zamiara on the first two possessions of the third quarter. The 6-foot-6 forward converted on both opportunities. Less than six minutes later, McQuaid led by five and Niagara Falls needed to take a timeout to try and stop the momentum. Taggart scored the next 12 points as the Jesuit Knights produced on 10 of their first 11 trips down the floor in the stanza. Taggart took a Kobe Long lead into the open for a layup. The junior guard then connected on a 3-pointer. Long threaded a pass to Taggart for an and-one and a tie game at 41. Three possessions later, Long took a Jon Catone feed for an and-one of his own and a five-point advantage at 48-43. Later, Long converted a steal and a layup for a six-point lead at 54-48. McQuaid’s lead eventually swelled to eight before Niagara Falls rallied. Josiah Harris connected on one of his five 3-pointers on the afternoon to tie the game at 61 with 3:56 remaining. A year ago, the Wolverines pounded McQuaid by 22 during the regular season. The Jesuit Knights avenged the loss with a 65-57 win the NYS Class AA Far West Regional. On Saturday, Jon Catone and Taggart scored back-to-back buckets early in overtime. Long followed with a 3-ball and McQuaid was on the way to its fourth win against one loss. Niagara Falls looked to run away with the game in the early going connecting on their first four 3-point attempts of the game. The Wolverines connected five times behind the arc in the first quarter and eight overall in the first half. McQuaid slowed the long-range attack to six three-pointers in the second half and zero in the extra period. Long finished with 23 points. Zamiara had 13. Catone added eight. Harry Bruu and Mike Maloney chipped in with two points apiece. Taylor Sanders paced Niagara Falls with 24 points. Harris had 15. Willie Lightfoot scored 10. Jalen Bradberry added 11. Jaemon Turner (6) and Mason Montgomery (4) rounded out the scoring for Niagara Falls. McQuaid hosts Franklin on Wednesday.